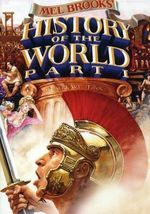 History of the World Part I Original Factory Sealed Product Details Format: Multiple Formats, Color, NTSC Language: English (Stereo), French (Mono), Spanish (Mono) Region: Region 1 (U.S. and Canada only.) Aspect Ratio: 2.35:1 Number of discs: 1 Rated: R Restricted Studio: 20th Century Fox DVD Release Date: September 5, 2006 Run Time: 92 minutes Bawdy segments include the dawn of man, Moses, Nero, the Inquisition and the French Revolution. Our items are shipped from multiple locations in the US; we tend to ship from the states that are closest to your location if those states have the ordered items. Sometimes DVD sets will arrive in multiple shipments usually right around the same time. In case one package shows up first, you'll get the next package right around the same time. PayPal only. It is your best protection as a buyer. Payment Method Shipping Handling Terms Regardless of when you purchased your disc(s) from us, if you discover that one of your discs does not play or suffers from some other manufacturing defect, please contact us; we'll solve the problem immediately. Free standard shipping to the Continental USA Only. No PO/APO Boxes. Trust also in our fast customer service, providing immediate assistance if necessary. International Shipping: We will work with's Global Shipping Program on eligible items. will charge fees and manage the shipment once they receive the package. PayPal only. It is your best protection as a buyer.